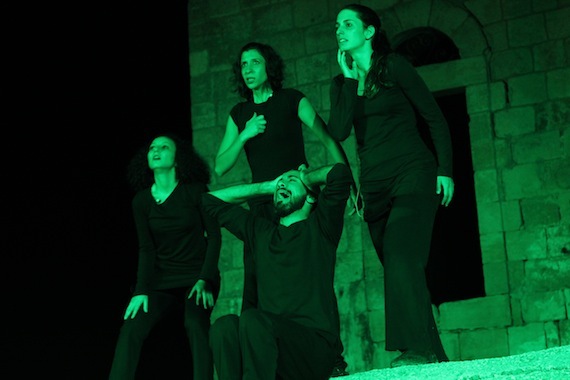 The Freedom Theatre performs in Nabi Saleh. By Bryan MacCormack. Mohammed returned to the central square of his village in a small caravan of cars with his friends. Their horns were blaring. This wasn’t a usual night in Nabi Saleh: Half of its 500 inhabitants were already out in the square, surrounding a makeshift stage of lights and speakers. His friends dragged him out of the car and through the crowd, toward the lights. The crowd chanted “Freedom!” and then found their way into a song that declares against the jailer, “I will love the dark.” There was a play already underway, and suddenly it was about him — and, by extension, the nearly three-year-old struggle of his entire village. That night in late September, after two weeks in an Israeli jail, Mohammed came home during a stop of the Freedom Bus. This nine-day tour through the West Bank was the work of the Freedom Theatre, based a few hours north (on a day without checkpoints) at the refugee camp in Jenin. In Nabi Saleh, to an audience of villagers and foreign supporters traveling on the bus, actors from the Freedom Theatre were doing Playback Theatre — hearing stories from people in the audience and turning them into improvised skits. Urged into taking a microphone, Mohammed described what had happened to him, and what has happened to so many others in Nabi Saleh. Israeli soldiers raided his home in the middle of the night, tore it apart and took him away for interrogation. He was forced to remain standing for hours at a time while blindfolded and hurled with insults. As the actors reenacted Mohammed’s story, his friends shot fireworks overhead. Mohammed, who looked to be in his early 20s, earned his detention simply by doing what people in Nabi Saleh have been doing since late 2009: demonstrating after Friday prayers, every single week, against land grabs by the nearby Israeli settlement of Halamish. His arrest is only one of more than a hundred that villagers have suffered since the protests began, including young children. Throughout, houses have been burned, windows have been broken, furniture has been smashed. “We want to make these demonstrations stop,” an Israeli intelligence officer told Mohammed. Bassem Tamimi is at the forefront of organizing the campaign in Nabi Saleh, his home. He is in his mid-40s, and four years of his life have been spent in Israeli jails. Israelis killed his sister and have arrested each of his children. His face is narrow, with a peppery moustache and dark wrinkles. He looks a little like George Orwell. “We decide to resist because we believe that our destiny is not to accept the occupation,” he said. Nabi Saleh’s strategy comes as a response to the experience of the Second Intifada of more than a decade ago, he says, when Israel was able to justify brutal repression by branding Palestinian armed resistance as terrorism in the international media. After Friday afternoon prayers each week, the villagers begin a march to the land confiscated from them by the nearby Israeli settlement. Together they approach the inevitable line of soldiers, who inevitably deploy a combination of tear gas, flash grenades, noxious “Skunk” spray, rubber bullets and live ammunition. Some villagers react by throwing rocks while others run. Repeat, week after week. “They will not give us a rose because we are resisting,” Bassem Tamimi said. “We do not expect that they will welcome us, and we are not welcoming them.” A relative of his, Mustafa Tamimi, was killed last year after being hit in the face by a tear gas canister. Mustafa owned the land with a spring on it that the village had depended on and that the settlement had taken. 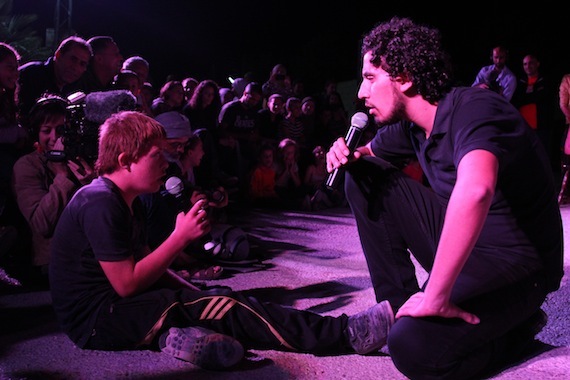 A Freedom Theatre actor talks with a boy in Nabi Saleh. By Bryan MacCormick. Resistance has thus become a way of life for everyone in Nabi Saleh. A point is made of including women and children alongside men. The effects of the fight are therefore visible among villagers of all ages, both men and women: missing fingers, scars and chemical burns. “We know that women are half of our society and half of our power,” Tamimi explained. As for the children, “We want to strengthen them, to make them strong to face the enemy in the future.” One little boy, I was told, had a special talent for throwing tear gas canisters back to from where they came. During the Freedom Theatre’s show, one women told of being arrested by Israeli soldiers while her children tried to pull her away. Another watched the actors recreate the day that she had to push her daughter out a window after soldiers fired tear gas into her house. A grandmother said that she goes to sleep early since most nights she can expect to be woken up by an Israeli raid. Balil Tamimi — Tamimi is a common family name in town — has taken on the job of documenting the protests. He looks about Bassem’s age and wears thick bifocal glasses. After the Freedom Theatre finished its performance, clips of video taken by him and others were projected on a wall, with scenes of tear gas canons on armored vehicles and soldiers shooting their rifles. It showed the fence that villagers have made out of spent tear gas canisters. 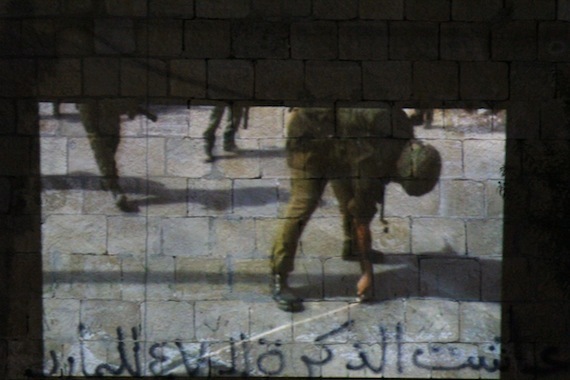 Video projected on a wall in Nabi Saleh. By Bryan MacCormick. The Israeli human rights organization B’Tselem gave him a camera soon after the campaign began, and he uploads his videos to the Internet. They’ve helped attract support from international media and the European Union. Now, in many of the demonstrations, supporters from Israel and abroad stand alongside the villagers. Their target is the mentality of occupation and control, of land grabs and night raids. When that is gone, the people of Nabi Saleh might be willing to welcome their new neighbors. At the end of the Playback rendition of Mohammed’s story, as is customary in the genre, the actors held their arms toward him with their palms facing up. The visitors on the Freedom Bus were applauding along with the villagers. The actors asked him whether what they had done was right — if they’d captured his experience or if he had anything else to add. As the Freedom Bus pulled away from Nabi Saleh and on to the maze of roads Palestinian vehicles are allowed to travel on, it passed a corner of the Halamish settlement. Behind the fences and the gate, one could see a group of settlers serenely gathered in a circle under a single streetlight. They were not soldiers with guns, nor were they innocents. It was just a momentary glimpse, and it might have seemed sentimental if it did not come at such a cost. Do it, or as the name of this site says, wage it. Absolutely. This is a pretty humbling message for those of us who spend so much time gabbing on and on about violence and nonviolence till the cows come home, often without actually doing much of either.